A poignant tale of family secrets and not always getting what you wish for. Pete lives with his mum and their cat, Coulsen. His Dad lives with his new partner, and Mum says his grandparents are dead. So when a card arrives from ‘Grandad’, Pete is puzzled. What is going on? 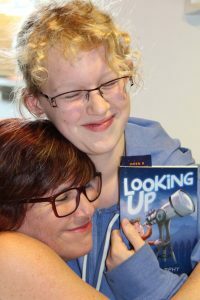 Suitable for readers aged 7 and up, Looking Up was released in May 2017. Available now in all good bookstores and online. Lamont Books : “Sally Murphy always writes such beautiful stories, and this is no exception.” You can read the full review here.